Buckhorn Inc., a leading provider of reusable plastic packaging and material handling systems, is launching a new line of automotive products at this year’s Modex Show. Redesigned with the latest molding and tooling technology, Buckhorn’s new state-of-the-art, straight wall hand-held containers are lighter, super robust and more ergonomic. And they come with first-rate Buckhorn quality, excellent service, and shorter lead times – all at a competitive price. Ideal for closed loop shipping, in-process handling and storage, the new straight wall stack-only modular containers deliver cost savings and efficiency throughout the supply chain. With more than 17 sizes to choose from, the new containers also have a new, lighter structural rib design that provides strength with less material reducing the tare weight of the containers. The containers are injection molded of HDPE for impact, moisture and chemical resistance. Same or mixed sizes can cube our pallet and top cap systems for space savings. The containers feature improved ergonomic handles with a larger radius for easier grasping, even when wearing gloves. The perimeter dust skirt prevents dust from settling in the boxes stacked underneath, and there is an optional textured label area on up to four sides for quick and easy label changing. 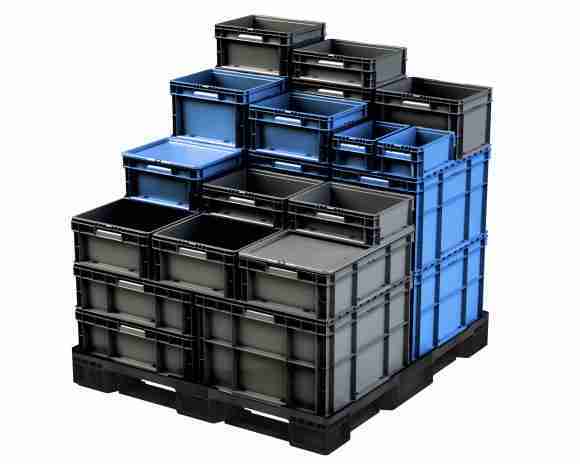 Our new 48” x 45” Romeo pallet and top cap are specially designed to transport the straight wall containers with extra strength, stability and product protection, from top to bottom. Optional built-in pallet lock seat belts wrap around the boxes and lock into the cap for more load stability. The pallets also lock into the ribs on the top cap surface for secure stacking. The pallet has a ventilated deck style and a sturdy, one-piece structural foam design that is 10 lbs. lighter than before. It features ergonomic hand holes for easy lifting while the fork tine cutouts in the 1” lip reduce the chance of forklift damage. Buckhorn, a Myers Industries, Inc. company (NYSE: MYE), is one of North America’s leading providers of reusable plastic packaging systems, helping customers in the manufacturing, distribution and food industries improve supply chain performance and reduce material handling costs. Focused on customer-driven innovation, Buckhorn offers a broad selection of bulk boxes, hand-held containers, intermediate bulk containers, pallets and specialty boxes. Call (800) 543-4454 or visit www.buckhorninc.com for more information.